Loving Hands Home Care Services has provided in-home care services to the elderly, developmentally disabled, bed ridden and permanently disabled individuals for more than 25 years. 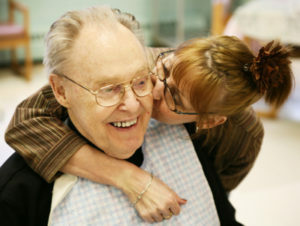 The Loving Hands team makes a difference in the lives of our clients each and every day. If you believe your loved one would enjoy the satisfaction of receiving assistance from the comfort of your own home, you may be interested in becoming a Loving Hands client. With Loving Hands Home Care you don’t sign a contract; you sign an agreement. You can cancel our services at any time and for any reason without any penalties. Most home care agencies require 24-48 hours’ advance notice to cancel without being charged for the entire shift, even if you don’t use their services! We understand your life is busy and unpredictable, which means you may need to cancel a shift at the last minute – with Loving Hands Home Care, you won’t pay any cancellation penalties! We offer flexible schedules, including days, evenings, overnight, live-in, and weekend hours. Most advantageous, all employees are insured and bonded through the company. Loving Hands takes responsibility for paying Social Security taxes, State Disability Insurance and Worker's Compensation.